Observers may only be able to access certain course files. 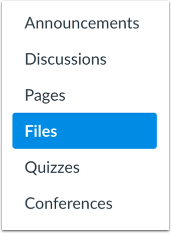 To open folder contents in the preview pane on the right-hand side, click an unlocked folder from the left-hand side. Click the name of the file. The preview displays the file and file information details, as well as a link to download the file. You can scroll through the document, zoom in and out, and view the document in full screen. You can also preview a file by clicking the View button. Click the Options icon  and then click the Download link . Previous Topic:How do I view my user files as an observer? Next Topic:How do I view the Grades page for a student as an observer? Table of Contents > Files > How do I view course files as an observer?